Most of the metallic materials are composed of micrometer large crystalline grains. It is now possible to elaborate nanocrystalline (grain size less than 100nm) or ultrafine grained materials (size less than 1μm). At this length scale, new physical properties emerge : for instance, metallic nanocrystals exhibit an increased yield stress up to 10 times larger than their microcrystalline counterparts. Micrographie en champ sombre extraite d’une séquence de déformation in situ dans l’aluminium nanocristallin. On remarque le mouvement rapide du joint de grain dans la partie inférieure de l’image. La ligne pointillée en b) indique la position du joint en a). Since several years, in situ Transmission Electron Microscopy (in situ TEM) has appeared as a powerful tool to probe the elementary plastic mechanisms at a pertinent length and time scales. CEMES is recognized as a world leader in this field. We perform in situ mechanical tests in a large range of temperatures. We contribute to the improvement of dedicated TEM holders (straining, high temperature, nano indentation). (MEMS) equipped with stress/strain gauges (coll. UCL Louvain, Johns Hopkins U., Baltimore, Georgia Tech, LAAS). Bulk ultra fine grained materials (UFG) obtained by severe plastic deformation or by sintering of sub-micronic powder. Thin films obtained by epitaxy on different substrate. 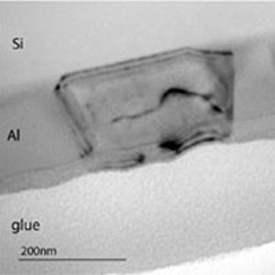 Al and Be monocrystalline sub-micron fibers (coll. Dislocation mechanisms in ultrafine grained metals (anelastic effect, dislocation/grain boundary interactions,...). The role of dislocation sources in sub-micron fibers. Sub-micronic Al fibers obtained from a selective etching of an Al/Al2Cu eutectic alloy have been strained both in an SEM equipped with a load cell in KIT, Karlsruhe and in a TEM. They exhibit a plastic behaviour from fragile to extremely ductile, largely dependent on the dislocation density rather than on the size itself (fig.below). We found that the yield stress is inversely proportionnal to the fiber size. This trend can be explain by the operation of spiral sources distributed randomly in the fiber. a) Dislocation spiral sources (composed of a fixed and moving arm) were observed during plastic deformation of sub-micron Al fibers. The strength of these sources measured in situ fit with SEM mechanical tests and provide evidence of the size effect on the yield stress. Plastic deformation is generally controlled by the motion of dislocations. Preventing this motion using grain boundaries (GB) as obstacles usually leads to structural hardening, but in nanocrystalline materials (involving a very high GB density), recent experiments have shown that GB migration can become an alternative plastic deformation mechanism. Unlike dislocation-based deformation, very little is known about the shear produced by the migration of a GB. We have investigated this process both experimentally and numerically in an Al bi-crystal. In-situ TEM experiments have evidenced that the GB migration occurred through the motion of steps (elementary or macro-steps), indirectly identified as disconnections. The shear produced by the GB migration exclusively depends on these moving disconnections. Atomistic models in which the minimum energy path of the shear-coupled GB migration was computed, confirmed this mechanism. Especially, it enabled the energetic characterization of the formation and motion of disconnections. Finally, high-resolution TEM experiments pointed to these GB disconnections. This study (PhD work of Armin Rajabzadeh) has significantly improved the fundamental knowledge of GB migration mechanisms by underlying the role of disconnections in the GB migration and the direct relation between these disconnections and the shear produced by the migration. K. Hemker (J. Hopkins Univ., Baltimore), H. Mughrabi (Université d’Erlangen), T. Pardoen (UCL Louvain), G. Dirras (LSPM, Villetaneuse), D. Molodov (Université de Aachen), O. Pierron (Georgia Tech. ), D. Gianola (U. Penn), O. Kraft (KIT, Karslruhe), S. Lartigue (ICMPE, Thiais), L. Jalabert (LAAS). N. Combe, F. Mompiou, and M. Legros. "Disconnections kinks and competing modes in shear-coupled grain boundary migration." Phys. Rev. B, 93:024109, 2016. F. Mompiou and M. Legros. "Quantitative grain growth and rotation probed by in-situ tem straining and orientation mapping in small grained al thin films." Scripta Materialia, 99:5 – 8, 2015. L. Farbaniec, G. Dirras, A. Krawczynska, F. Mompiou, H. Couque, F. Naimi, F. Bernard, and D. Tingaud. Powder metallurgy processing and deformation characteristics of bulk multimodal nickel. Mater. Charact.,94:126–137, 2014. A. Rajabzadeh, F. Mompiou, S. Lartigue-Korinek, N. Combe, M. Legros, and D. A. Molodov. The role of disconnections in deformation-coupled grain boundary migration. Acta Materialia, 77:223–235, 2014. J.A. Sharon, Y. Zhang, F. Mompiou, M. Legros, and K.J. Hemker. Discerning size effect strengthening in ultrafine-grained mg thin films. Scripta Materialia, 75(0):10 – 13, 2014. F. Mompiou, M. Legros, A. Boe, M. Coulombier, JP Raskin, and T. Pardoen. Inter- and intragranular plasticity mechanisms in ultrafine-grained Al thin films : An in situ TEM study. Acta Mater., 61(1):205–216, 2013. A. Rajabzadeh, M. Legros, N. Combe, F. Mompiou, and D. A. Molodov. Evidence of grain boundary dislocation step motion associated to shear-coupled grain boundary migration. Phil. Mag., 93(10-12, SI):1299–1316, 2013. A. Rajabzadeh, F. Mompiou, M. Legros, and N. Combe. Elementary Mechanisms of Shear-Coupled Grain Boundary Migration. Phys. Rev. Lett.,110:265507, 2013. F Mompiou, D Caillard, M Legros, and H Mughrabi. In situ TEM observations of reverse dislocation motion upon unloading in tensile-deformed UFG aluminium. Acta Mater, 60(8):3402 – 3414, 2012. F Mompiou, M Legros, A Sedlmayr, DS Gianola, D Caillard, and O Kraft. 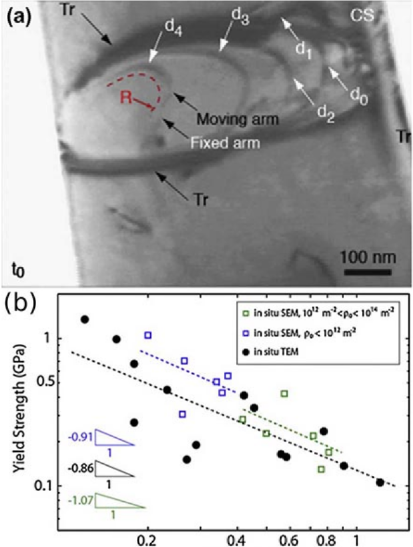 Source-based strengthening of sub-micrometer Al fibers. Acta Materialia,60:977–983, 2012.